I like very bright colours, especially purple, and while in the summer many wear them, during the winter months most of the clothes available are in dark colours and it just reinforces the gloominess of winter. But at the moment it is still summer and sunny, which is quite rare here, so I try not to think about that. 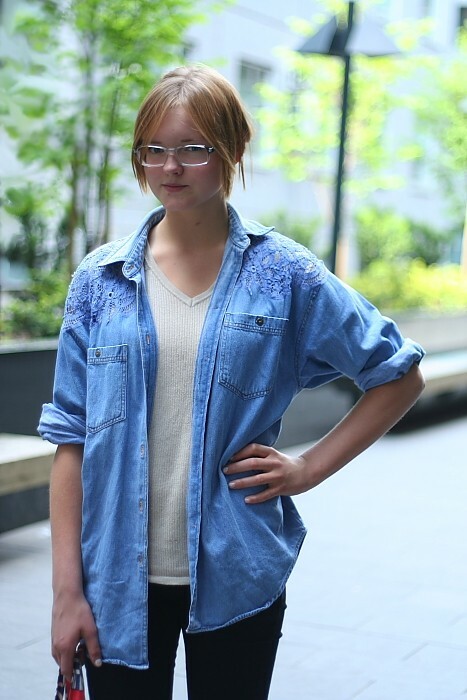 I’m thirteen and many people in my age group look kind of the same and wear clothes that all their friends are wearing, but I have always wanted to be different and experiment with clothes. However, clothes I wear are more influenced by my moods than anything else, because designer clothes are not really available, so I don’t feel a need to go through many fashion magazines to get ideas and, instead, I just browse Cosmopolitan or other similar publications for entertainment. This summer I’m into this flirty girly look: flowy short dresses and skirts, flower prints, bows, hairbands … But I’m already stocking up patterned leggings – abstract, animal etc prints – and oversized sweaters for Autumn. I used to live here, but currently I live in Ireland so I do most of my shopping there. My favourite shop there is Urban Outfitters and I get most of my clothes from there. I like to have an eclectic personal style with mixing all kinds of different clothes. My longtime favourite designer is Matthew Williamson. His clothes always have these amazing prints and are generally very me. 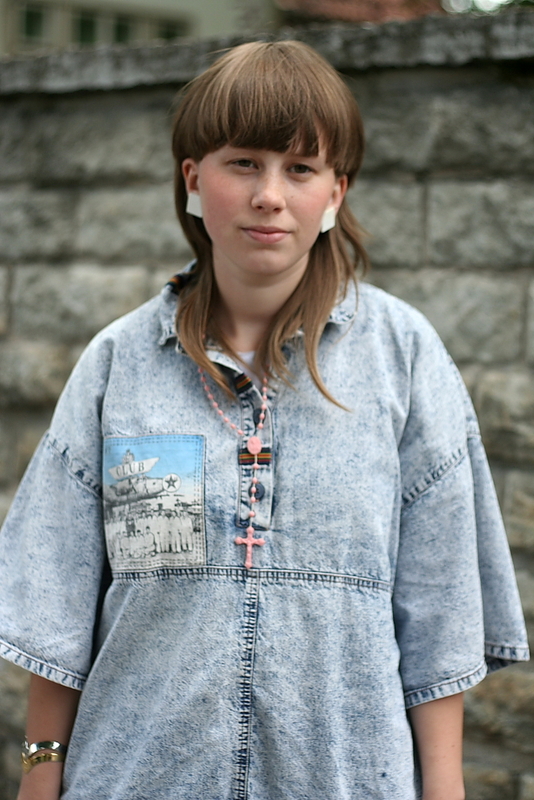 I just got this denim shirt with these lacy bits a couple of days ago for my birthday. This summer I really like light denim and other pastel and soft shades. However, my preferences in fashion are changing constantly; just recently I was into bold colours. This Autumn I think I will be wearing some high-wasted skirts and trousers and simple tops with them. In the high school I go to, I’m not allowed to wear jeans to school, so no denim for Autumn… My favourite fashion houses are old classics like Yves Saint Laurent and Chanel, but also new ones like Alexander Wang. With brands like YSL and Chanel, I feel that you have to have a certain presence and maturity to carry them off. I hate when designer clothes are worn with otherwise trashy outfits. I think many Estonians, including me, are quite cautious with what they wear. I don’t want to seem too vain and look as if I spend too much time thinking about my appearance. However, I still want to feel pretty. I have some favourites like different shades of blue, dresses, especially nightgown-like, and I admire Audrey Hepburn. But most of my everyday choices are quite random – especially when it comes to accessories and small details like these earrings and pins on my shoes. I wear everything that seems right, but that’s it, I don’t want to pretend my outfits have a deeper meaning behind them than they actually do. Today I’m looking for a pair of nice strappy heels and it is so difficult to find ones I really like. I work as a model, which is why I travel a lot and I’m around different designers and all that experience has really influenced my style. I have this kind of globetrotter style, which means my clothes have to be simple, comfortable and that they have to work in different places and environments. My favourite fashion houses are Alexander McQueen, Lanvin, Balenciaga and Chloé. However, I would never wear visible brand logos. My favourite Estonian designers are Oksana Tandit and Aldo Järvsoo, who have these amazing delicate and one-of-a-kind dresses. However, in Estonia, sadly, people still prefer to buy many cheap dresses than to actually invest in a more expensive yet a classic and good-quality dress. However, usually you wear these cheap clothes a lot less, because they have poor quality, go out of fashion more quickly or you just don’t value them as much. I recently visited Crete, where all the art, architecture and culture was so beautiful and exciting so I’m still being inspired by it. However, maybe a bit more in home decoration than clothes. I try to travel as much as possible, so all these different cultures and experiences have this kind of uplifting and inspiring effect on me. I’m currently feeling nautical yet minimalist style, which is kind of reflected by this vintage dress and, actually, the entire outfit. Otherwise, my clothes have to be comfortable and appropriate for many different occasions– I prefer outfits that would look OK for shopping or a work interview or something else that might happen. I really like shoes and watches, but my other half is very rational and doesn’t understand why I need so many. I think everyone wants to define oneself as somehow unique and the easiest way to do that is by dressing up in a certain way. I choose clothes that other people necessarily would not wear. In Estonia very many people define themselves through brands and have these huge brand logos visible on everything imaginable. I hate such clothes and style. Wearing Gucci, and Dolce & Gabbana and so on doesn’t mean you have a great style. I get my clothes from small second-hand shops – this jacket is from Iisraeli Keskus (Israel Centre) and shoes are from a second-hand in Haapsalu. My thing is to wear a lot of different colours, big sweaters and I like to plan my outfit a day in advance. I think in Estonia people in one social circle tend to dress alike, so my friends definitely give me ideas what to try next. My style is pretty simple and I wouldn’t wear uncomfortable clothes. I tend to shop at second-hand stores. These dungarees and shoes are both from there and, especially, this pair of men’s shoes is my favourite item this summer. 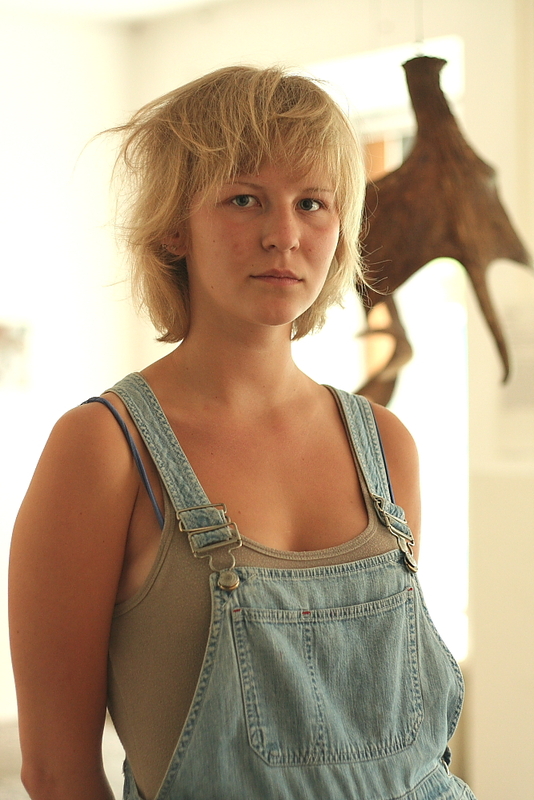 I find Estonian art scene very inspiring. I think there are many young artists, who are creating these very exciting pieces and actively representing Estonia abroad. Also, I try to find out where different artists get their inspiration from – either through the Internet or by meeting the artists themselves, for example, at exhibition openings. All artists are very different so the story behind their work is unique and inspiring. I’m a photography student from Finland and I currently live there in Helsinki. The street style there can be almost described as performance art. I’ll be honest – I’m quite easily influenced. People around me - my friends, family and, especially, my younger sister- tell me about what is going on in high fashion and through that they also shape my style choices. I’m also inspired by the work of photographer Katharina Fengler and stylist Eva Bühler. This summer most of my clothes are these oversized short dresses, because they are just so comfortable and look good on me. 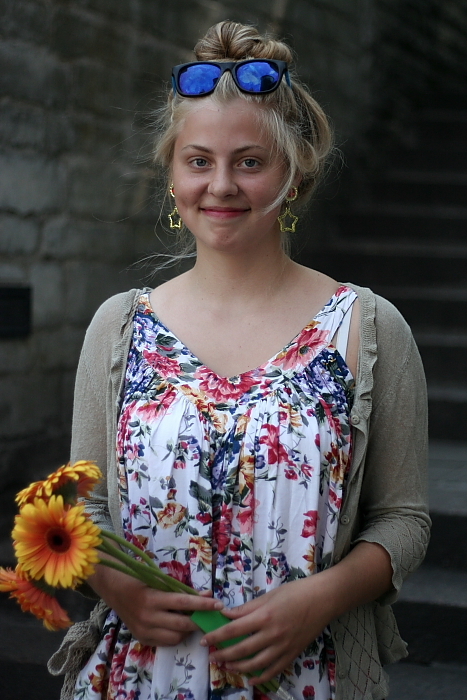 I’m a student so I mainly shop at thrift stores and at these Swedish high-street chains like H&M. I just noticed today how older people have started to wear so cool and quirky accessories – a lot of colours, neon coloured shoes and so on. It is great to see that. I’m actually from Tartu and one of the organizers of Tartu’s ‘Müürilille täika’ (Müürilille flea market). Most of my clothes are vintage or second-hand. 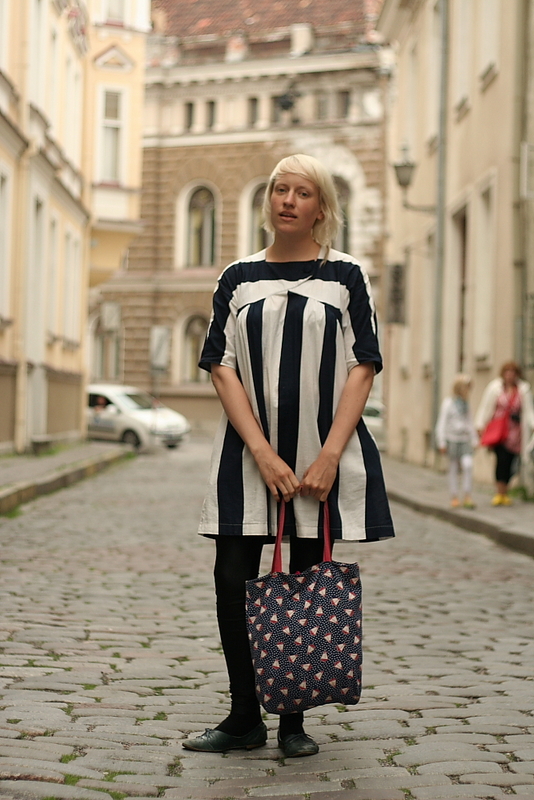 I just got this denim top from a second-hand in Helsinki, leggings are from Humana, and the bag is from some other thrift store. Because most of my clothes are second-hand, I’m not that concerned with what is going on at the moment in the fashion world. Then again, maybe it is quite usual in Estonia that people are doing their thing and don’t care what is in. Besides second-hand, I love American Apparel. I’m originally from Japan, but I partly live in Paris and then partly here in Tallinn, where I’m working on an architecture project. I think I’m still very strongly influenced by Japanese designers and artists, especially by some I have worked with. It is great to see the work process and how they get inspired. When talking about my personal style, I would describe it as neutral, natural and adaptive to the environment I’m in. I like to change my outfit by adding and changing accessories. Today it is all about this scarf. 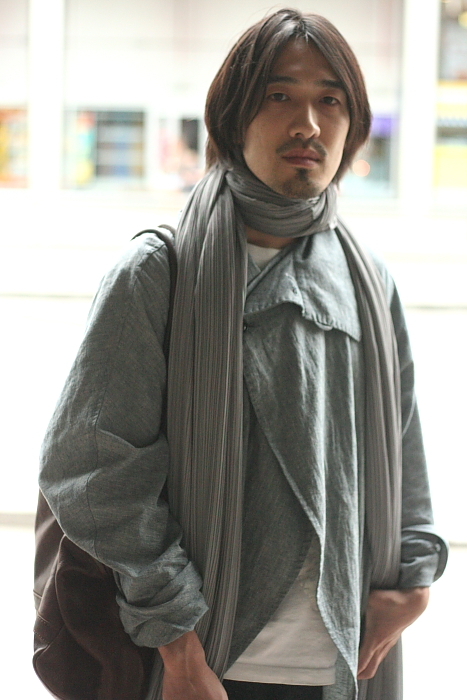 My favourite designer is Issey Miyake. I try to think green and “recycle” clothes – these trousers and shirt used to belong to a friend and I buy a lot of second-hand clothes. Also, I make my own jewellery, for example, this necklace today. It is important to understand what kind of message your clothes are sending and that first impression is also based on what we wear. I’m not sure how many Estonians think about that, especially those women who wear those nonexistent skirts and tops. When choosing what to wear, I usually pick a piece I really like and build everything else upon it, for example, today, I wanted to wear these corduroy trousers and these leg warmers, and then I just added everything else. Fashion is definitely a form of art even if some like to believe it isn't. I went to an art school, but I always felt that other forms of art did not excite me as much or I wasn't that good at them, so for me my personal style was, and still is, an artistic expression. 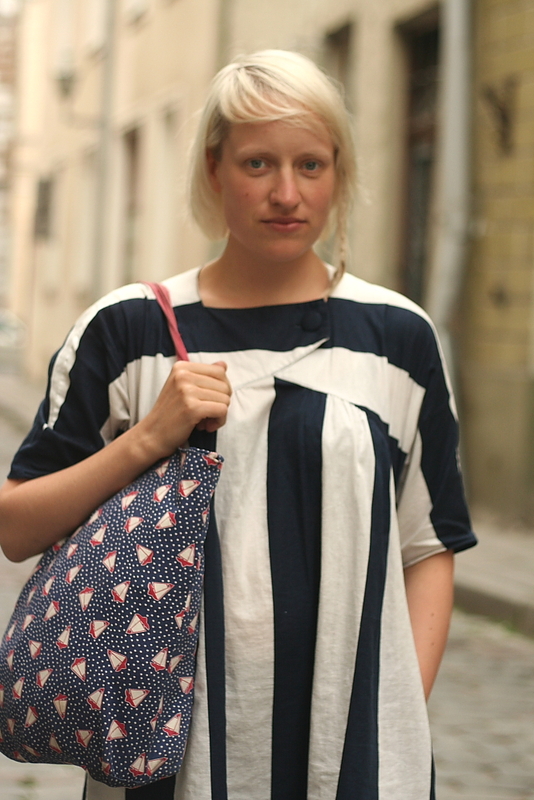 I really like many Estonian designers, but my favourite is definitely Liisi Eesmaa. Many of my friends are also more and more into Estonian fashion scene and I think Estonians, in general, are willing to spend more money on one of a kind pieces by young local designers. This summer I really like these big sun hats. I'm going to Italy soon and my goal is to find the biggest floppy hat out there. I would not survive without art and good music. I study art myself, so, of course, I’m very strongly influenced by it. Also, most of friends study art and are very inspiring and original. I think in Estonia there are very stylish people, but they move in certain circles, so they seem hard to find. If I have to choose a style icon, I would say Bob Dylan, or maybe some other more old-school musician. This summer I have been mainly wearing latex or leather leggings, white oversized t-shirts and these sunglasses – I’d just throw these things on and I’m good to go. I like to read fashion blogs to see what is going on in the fashion world; there are so many wonderful blogs out there that I can’t name my favourite. To be honest, I really dislike dividing the street style scene into these sub-scenes like punk, nu-rave and so on. I know some people could say that my outfit today is bit nu-rave, but, in reality, I wear so different outfits every single day that I cannot describe my personal style. Today I went to a beach so it kind of reflects that and my mood. I don’t buy too many clothes from ordinary high street shops. It is so awkward and unpleasant when you see someone else wearing the same clothes as you are. Therefore, I tend to shop online and my favourite shopping site is definitely eBay.